On my way, I spent a few hours in Brussels (taking the Eurostar train from London) before getting on a train to Antwerp. I had lunch with BookMooch fan and Associated Press Reporter Aoife White, a Dubliner who's relocated to Brussels since a few years. Found out that she'd mooched two books from my wife, which was an amazing connection. Wednesday night kicked off with me having dinner with Bob Young, the CEO of Lulu.com and founder of Red Hat Linux. We had met a year earlier in London, but I didn't have BookMooch launched at that time, so I didn't talk to him about it then. I had told our mutual friend Laurie Racine (also a CC Board Member) about some ideas I had for Lulu and BookMooch to work together, and she wanted us to meet. As often happens, the best way to meet busy people is when they're away from home. We ate at the Michelin-starred super-casual Gin Fish Restaurant where the chef brings you whatever he wants, and he makes different food each night (mostly fish). Bob & I gabbed late into the night, and we hope to figure out a way that Lulu and BookMooch could work together. At the conference, I met French super-blogger Loic Lemeur. He's also a compulsive serial entrepreneur, and we got on famously. Most recently he was working for Six Apart, but he's a free agent now and he bounced a half dozen business ideas off me (I wasn't of much help, unfortunately). My presentation assignment was "What will the Internet be like in 2020?". A PDF of my presentation slides are below. I believe there are also plans to put video of the presentations on the web, and I'll put that up here when it's available. I shared a 90 minute cab ride each way to the Free University of Brussels with BBC Creative Archive project leader Paul Gerhardt. I've known a number of people who've worked on that project, but never met Paul. After 3h trapped with me, I'm sure Paul had enough of my babbling about CC, Magnatune, and all that, but we got on well and promised to meet up in London, where Paul also works with a number of other UK groups that are running their own Creative Archive inspired projects. In November, Linux music player Amarok shipped with Magnatune support built-in. As far as overall sales go, I'm very pleased as they've been strong and consistent. - 473 albums sold through Amarok Since October 31st 2006 to April 20th 2007. - after the visa processing fee is taken off the top, this is $3,198.84, which then means $320 for Amarok. Annualized, at this current rate, this should be around $1,000 a year for Amarok, and $10,000 for Magnatune, which is absolutely great, as I'm happy to support them. - the sales are very consistent -- a few albums sell because of Amarok almost every day, which suggests the feature is not viewed as a gimmick, but as something that is used regularly. The chart at the right shows how rock-solid reliable they are. A few months ago, I met the classical music representative from iTunes, at Skywalker Studios where Magnatune artist Lara St John was recording a new album. Lara has a separate agreement with iTunes, and she's one of their best-selling artists. I struck up a conversation with him, and now have a good relationship with iTunes (at least on the classical side). They indicated an interest in promoting some of our new releases (the ones that interest them), if we were willing to give them an exclusive time period, where the album was only available on iTunes, and not on the Magnatune web site. We're trying that now, with a recording by Philharmonia Baroque of Beethoven's 9th, which iTunes now has for sale at their store. 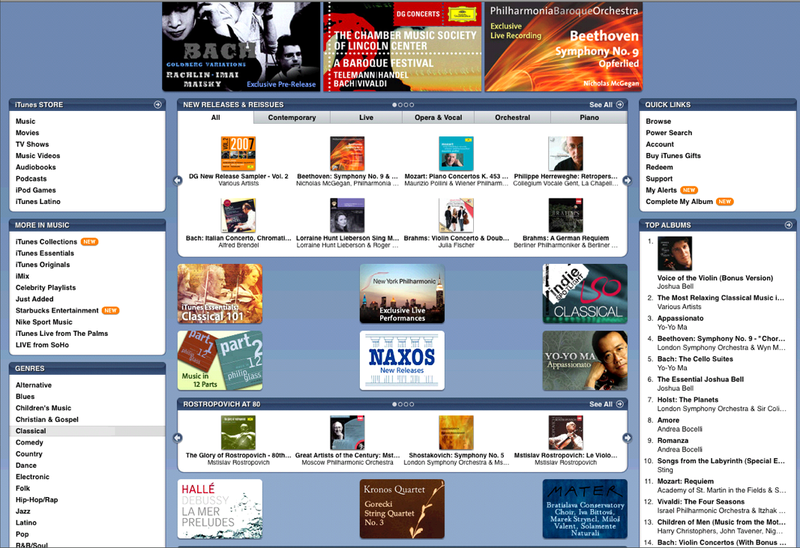 iTunes is advertising the album on the top of the classical page (the ad rotates with a few other ads). Apple isn't yet giving us the power indicate "no DRM" but as soon as they do, we'll be selling no DRM audio on iTunes. In other news, I've been working with digital distributor IODA for a few months to help them finalize their bulk-import standard. IODA will help us get the rest of our catalog into iTunes, because we've found that iTunes mostly doesn't like to work directly with non-major labels. I just got notification from IODA yesterday that they're ready to start importing using their new XML import standard. We're the first with them to ever use this new bulk method, as previously every album had to have all its details hand-typed into an excel spreadsheet. 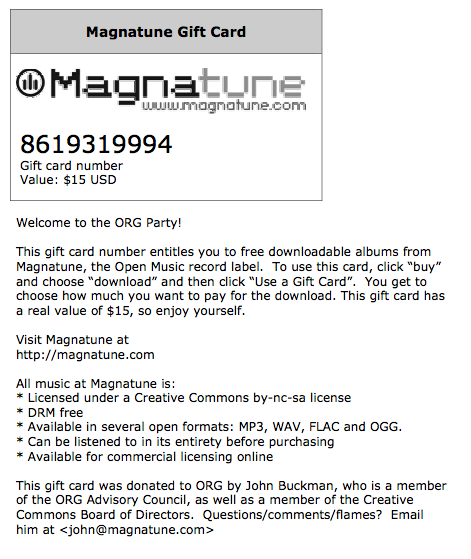 Magnatune music should start appearing on iTunes fairly soon now, which I'm excited about. It should also appear on eMusic and a few other music services. Over the next few months I'm going to be traveling a lot. If you live somewhere I'm traveling too, please drop me an email and let's meet up and have coffee! May 13-May 24 : Northern Italy (mix of vacation, and Magnatune business visiting Montisi Harpsichord Center). I'm traveling with my good friend Mary Deissler. May 25-28 : Zurich, Switzerland. Giving the keynote presentation for the launch of Creative Commons Switzerland. June 14-18 Dubrovnik, Croatia : speaking and partipating the iCommons Summit. June 19-July 31st Berkeley, California : back home, 6 week break from traveling, phew! 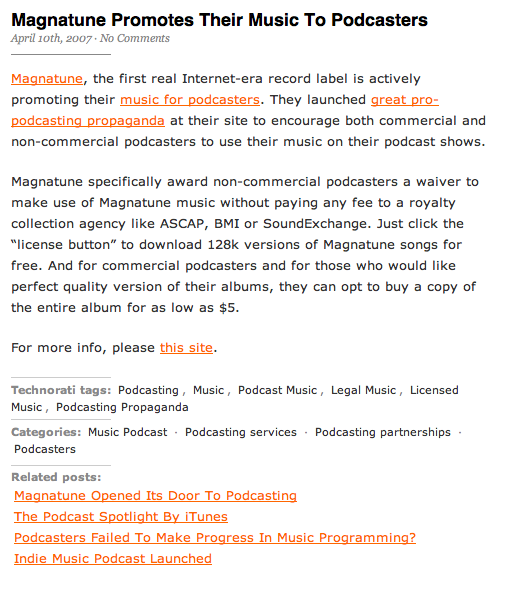 Two podcast news services recently ran small stories on Magnatune. 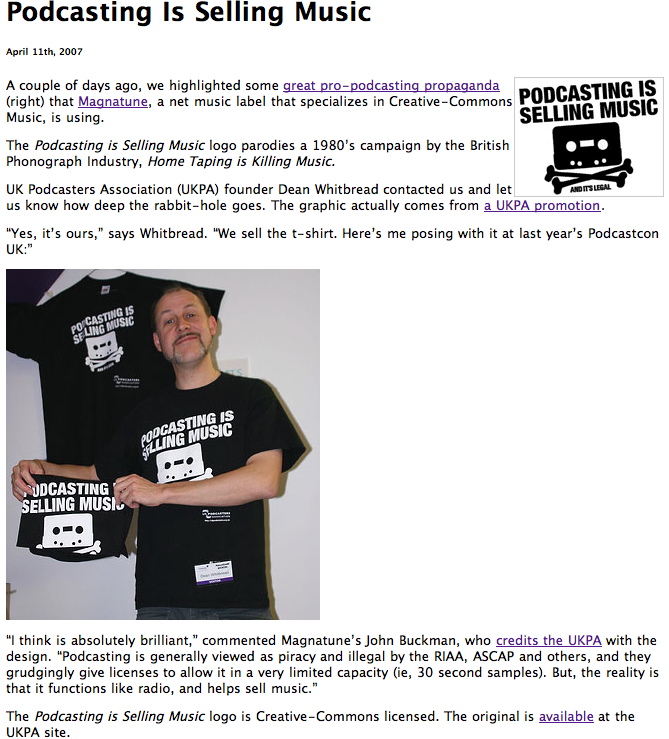 and thanks again to the UK Podcasters Association (hello Dean Whitbread!) for creating this fabulous propaganda graphic. There's an Economist by the name of Tobias Regner (http://ssrn.com/author=404730) who writes a lot about digital music and other Internet topics, and he really likes Magnatune's "pay what you want model". He wrote a famous paper about it in 2005, which is at http://papers.ssrn.com/sol3/papers.cfm?abstract_id=721596 and it got a bit of press, which is really helpful to Magnatune. Tobias wants to do another paper on Magnatune, and asked me to send his survey to the top Magnatune customers. I sent his survey to about 600 people, being those who have purchased 10 or more albums from Magnatune. The resuls are anonymized, and a summary of the results is visible below. About half of the questions were text fill-in, and thus couldn't be summarized, so I haven't included them below. 4. Would you say that you generally rather pay less, around the recommended price or above it? 11. In which country do you live? 13. In which range is your monthly personal income? 15. Do you actively make music, for instance as a member of a band? 16. Please rank the following statement: "It is important to me what others think of me." 17. Are you donating to charities and if so how often? 18. If someone does something that is beneficial to you, would you be prepared to return a favor, even when this was not agreed upon in advance? 19. Do you tend to consider strongly what others believe is appropriate when you make a decision? 20. If somebody puts me in a difficult position, I will do the same to him/her. Would this apply to you? 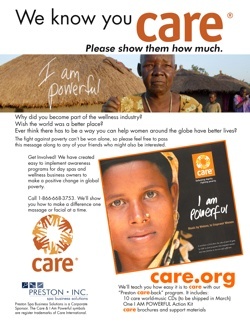 I just got news that CARE, an important charity that fights poverty, has licensed DJ Cary's Eastern Grooves compilation. 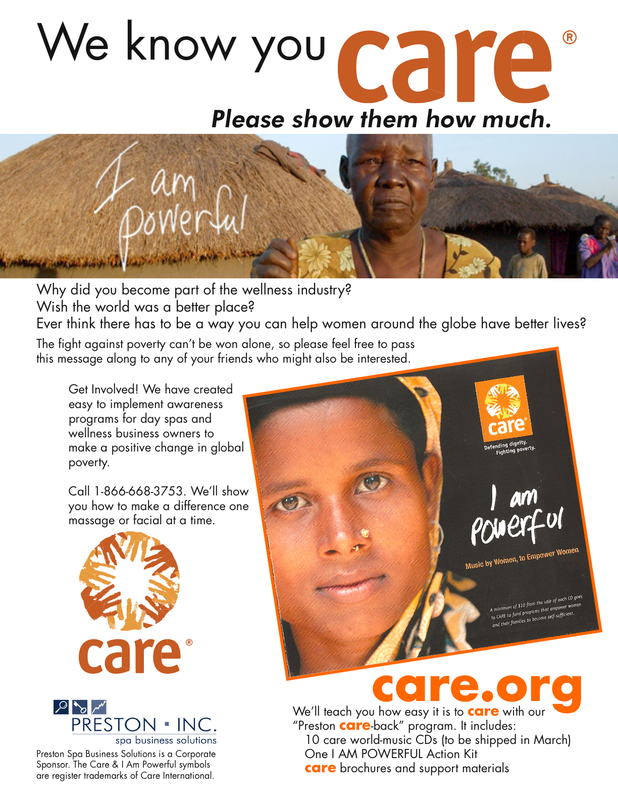 They'll be making 500 copies of a CARE-branded world music CD as part of their fund-raising effort, and they hope to raise $10,000 with this CD. This is great: the musicians get paid, it helps CARE raise money, and this amazing music gets a wider audience. 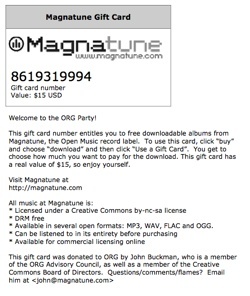 If you are charity having an event, and would like to give away Magnatune Gift Cards as part of the gifts for that event, please contact me. The Open Rights Group, of which I am a member of their Advisory Council, is having a party next week, and wanted to include these in their gift bags. A sample of the print out I made for them is attached to the right. We also did a similar promotion for a Bay-Area NPR Radio Affiliate, KQED, and they talked about Magnatune for hours and hours on the air during their pledge drive. This was way, way better than advertising for us, and it helps the radio station raise money, which we think is great. The BBC is reporting that EMI is removing the DRM on its iTunes music. EMI said every song in its catalogue will be available in the "premium" format. It said the tracks without locks will cost more and be of higher quality than those it offers now. He (Jobs) said the more than half of all the tracks available in the iTunes store would be available DRM-free by the end of the year. ... Apple boss Steve Jobs ... said: "This is the next big step forward in the digital music revolution - the movement to completely interoperable DRM-free music." This is great timing, as we're just about to get our music on iTunes, and I'm definitely going to make sure our catalog gets on iTunes without DRM (if Apple will let us). We're also marking our albums as "mid-price" so that if Apple ever does tiered pricing, Magnatune's music will be slightly less expensive. n.b. : Kirk McElhearn wrote an excellent 10-point summary of what this change means. Joi Ito's conference I attended this past summer is the conference that keep on giving. Now my presentation is available in a Japanese magazine. Impress, a Japanese publisher, just released a Mook (magazine/book) called The Future of Web 2.0 - The Sharing Economy based on presentations at the Digital Garage New Context Conference last year in Tokyo. The book is in Japanese. ... A really cool thing about this is that Impress has decided to release this mook under CC BY-NC (v 2.1 Japan).